On August 31, 683 A.D., 6 Edznab 11 Yax in the Mayan calendar, the sacred light that illuminated Palenque for several decades was extinguished. A new cycle would start from Pakal's death. Also known as Lord Pakal The Great, whose birthday was made to coincide with the inscriptions of the First Mother, the goddess Zac K'uk o Garza Blanca, name that also had the sovereign's mother. His birthday, March 23, 603 A.D., 8 Ahau 13 Pop, linked his origin to the Gods, confirming his sacred character and destiny of becoming the wisest ruler of Palenque. Eleven years before his death, her wife Ahpo Hel, would descend into the Kingdom of the Shadows, leaving Pakal in a painful loneliness. During the precise moment of his death, in the Royal bedroom of the Palace, the priests put on his mouth a beaded piece of jade that received his vital breath. Later, they spread maize dust, the sacred substance for which men are made, and then, proceeded to enshroud the body with cotton clothes. On his side, they deposited pots with water and food as well as protecting amulets. After the normal ritual held for three days (the waiting), speaking to him so he would not feel lonely, taking care of his shadow and praying to the gods to maintain his life with the Spirit while he continued his road to Xibalba, his sons Chan-Bahlum and Kan Xul and their wives and grandsons gave the signal to prepare the most splendid funeral that Mayan eyes have ever seen. Through the ceremony, the survivors would add their contribution to help the spirit of the beloved Lord during his dangerous walk down to Xibalba, "the place where the souls vanish." There, he would face Ah Puch, the Dark Master God, for the first time, to later die definitely, meaning transforming his death into pure energy and positioning himself in the cold and dark subterranean Kingdom. Pakal would go to Xibalba first because he died of natural causes, although due to his sacred condition, he would be allowed to ascend to the Earth level again or higher in some ocassions. Others would go to the Paradise of the Ceiba Tree, if they were sacrificed to the gods or were women who died while birthing children to live in company with the Sun in its daily run. The destiny place how Death find humans always depends on the manner of dying, and not on the behavior of their corporeal human existence. The moral mistakes are punished in life, usually with some kind of disease and critical pain. Humans still do not understand this concept of Mayan purification. Years before, Pakal had ordered his tomb as a pyramid of nine levels. On the top, he erected a temple in which the history of his lineage and legacy was written describing the Great Shaman that would be converted into another God. In his honor, his sarcophagus was deposited at the bottom of the inverse pyramid representing Xibalba, the nine level. His spirit would ascend through a narrow channel in the shape of a serpent connecting the funerary chamber with the Temple. On a beautiful stone that would be deposited on top of the sarcophagus, Pakal ordered to carve the great cosmic image that would define his position in the center of the world as a ruler and human being. The meaning of this magical and powerful stone has been written in another article of the website (Pakal's Hidden Secrets). The solemn court left the Palace carrying the mortal body of Pakal. Four men holding torches initiated the Funeral March, and on the top of the pyramid they burned copal wood, an aromatic incense. Behind Pakal's body, the Great Lord Snake, the highest priest, was followed by the 36 Priests of the Solar Ritual and the family of Pakal, while the people watched the Walk of the Five Men and One Woman, to the top of the pyramid, escorted by Mayan guards. These outlaws were selected by the High Mayan Supreme Tribune to exemplify human faults (Greed, Destruction, Anger, Hate, Envy and Viciousness). They would be sacrificed at the entrance of the chamber, each one representing a moral human imperfection waiting to be cleansed, in order to accompany Lord Pakal. To end the Funeral, his people remained during the night singing and praying to the gods until Venus dissapeared from the horizon while crossing the Sun. In 1952, a man that knew how to respect and love the Mayans, Dr. Alberto Ruz Lhuillier, would discover his tomb giving to Pakal the start of his new cycle: his immortality also in this world and the fulfillment of the Great Mayan Prophecy after 1269 years of silence.making possible the reincarnation as Lord Pakal Ahau on August 22, 1952 and the return of the Mayan King.. 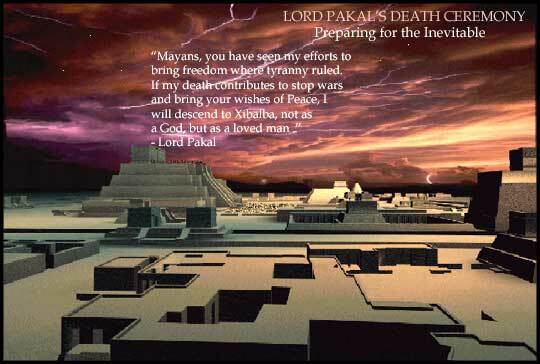 Thus, Pakal Ahau becomes the last Pakal of the Great Mayan Prophecy to be the time witness on December 21, 2012.